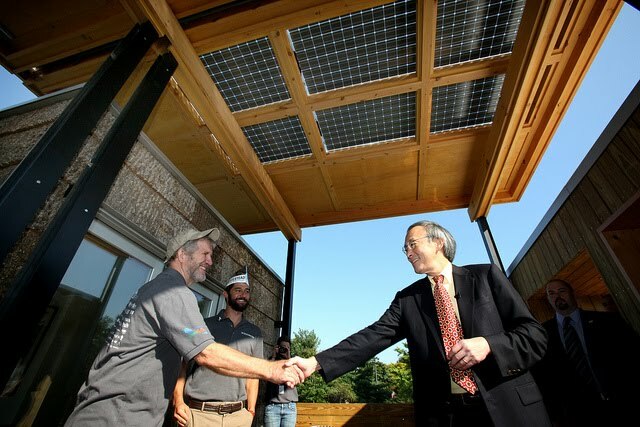 The ASU "Solar Homestead" entry in the 2011 Solar Decathlon has won the People's Choice Award plus two other prizes. That's Department of Energy Secretary Steven Chu shaking Jeffrey Tiller's hand in D.C. yesterday. Tiller is chair of the Technology and Environmental Design Department at ASU. We're so proud of Tiller and his team of creative, dedicated students. They certainly ought to have won the people's choice award as they sent emails to alumni asking them to vote for it. Maybe the other schools did too. they helped another team. sportsmanship. i think it's called. YAY! appsters. They also came in second in Communications, and third n Architecture. A gold, silver, and bronze is fantastic. Way to to Apps. Dare I say it--three medals in this competition is bigger than ...Division I football?